Probably the cheapest among all headsets that we have reviewed thus far, the Sades SA902 7.1 Surround Stereo Gaming Headset is one of our favorites in the testing team. Why? Because it does an amazing job without cost much. Decent sound quality, reliable design and super comfortable massive ear pads are things that we look for $50 plus headsets and this headset gives all that at a fraction of the cost. Besides, 7.1 surround sound does wonders with your gaming experience, especially when you need that advantage over your compatriots who are just too good at a snooping on you. The one gripe everyone has with expensive gaming headsets is that it hurts when you accidentally rip the cord or if one of the sides suddenly decides that they have had enough of your abuse. Problem is going cheap means you have to sacrifice on a lot of features and comfort. The Sades SA902 fortunately is a jack of all trades. It doesn’t cost much and the sound quality is above average. 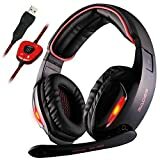 The reason why the Sades SA902 can match expensive gaming headsets is because it uses USB 7.1 channel surround effect. This together with the massive size for ear pads allows for passive noise isolation and a comfortable fit. Besides, surround sound gives you complete immersion in whatever it is that you play. This Sades headphone packs in reinforced padding with total of 4 unique pieces that are extra soft and comfortable. Speaking of ergonomics, the mic can swivel to a large extent but it won’t extend though. A controller unit sits pretty at one third the length of the cable that provides everything you will need. Sticking to basics, the Sades SA902 doesn’t try and reinvent the wheel. Considering the price tag they sell at, it doesn’t even make sense trying out new and innovative designs that may or may not work. What the Sades packs is a massive set of ear pads that don’t sit on your ear but literally cover your ear and sit on your head. This ensures maximum comfort with long duration gaming. Next, the microphone isn’t full sized, extendable but at least it swivels for times when you don’t want to game online and simply wish to enjoy the silence of solo missions. As for the cable, it is pretty long and besides being made for gaming, you expect such long cables with gaming headsets (not that all of them offer such long cables). The cable is rigid enough and though reinforced with nylon, I don’t think it is braided. Let’s move to the buttons, well that’s the one place where we felt let down. Whoever had the brilliant idea of putting the buttons about one third way down the cable must be found and fired immediately. By having the buttons on the cable so far down, it runs the risk of getting caught with the chair arms, or accidentally squeezing beneath your bum when you finally get those few seconds to adjust yourself as the next mission loads. Worse still, the buttons are easy to press and because they are easy to press you inevitably wind up losing voice or audio, wondering what went wrong. Does it outdo a $100 headset? No absolutely not. There really isn’t a lot of features that the Sades SA902 boasts of. However, what it does great is produce acceptable and at times impressive sound quality. As far as gaming goes, the drivers on these units are more than capable of producing a wide range of subtle sounds from all directions, even above and below. This is something that only a USB 7.1 surround sound headset can deliver. However, if you want to listen to music and have a low tolerance for blurred mids and highs then don’t ever try using this headset even with a DAC or top notch audio player. Thankfully, it packs in a microphone that is free from static and interference. You can hear your partners pretty clearly and your voice won’t be a pain to them either. If only the mic could be a tad bit closer or at least have an extension ability. As of now, it only swivels. However, beware because of its smaller length, it will inevitably catch ambient noise, which isn’t a problem with gaming though conference calls and skype won’t be crystal clear if you intend to run a fan or air conditioner at the same time. Using the Sades SA902 for a few days now and I felt it particularly does well in the comfort department. Huge ear pads that kind of nestle all over your ears without ever touching them. Because the entire support is on your head, your ears can breathe and stretch. This keeps them relaxed and even after hours of gaming, I felt just fine removing the headset. Timothy tried the headset and he has a wider head. The Sades SA902 literally stretched to accommodate his size and that was nice to see. Anyone can use this headset, regardless of their head size. Men, women, children – it works for all, kind of like a one-size-fits-all. So if you want something that you can keep as a spare because you have a lot of friends who come over to game and you don’t want to give your $200 gaming headset to them, this is what you get. Coming to the overall sound quality and usability, this is no Bose or Audio Technica but it is a cheap headset that does rather well. Clarity drops as you start reaching for the extremes in the frequency range but for majority of the time, it is crystal clear and quite balanced. 7.1 surround works as advertised and in gaming, this comes as an added advantage as you practically can hear everything around you. The good thing is that voices of other players come in a stereo kind of feel while the entire game audio, sound effects all surround it. Oh, and for those who love LED lighting or have a gaming rig that’s colorful in the dark, the Sades SA902 has glowing LED lights and you can match your purchase to the color of your setup. A nice after thought from Sades. Above average sound quality that will satisfy almost all gamers. It allows for watching movies and listening to music as long as you aren’t too picky about the sound. Movies though sound awesome with the surround experience. Lightweight and thoughtful design with the metal torso capable of stretching quite a bit. It makes for a very comfortable gaming headset. The mic swivels nearly 160 degrees meaning it can go down all the way or parallel with the headphone arch. This is a nice feature since it can be irritating having the mic protruding when you are simply watching a movie or playing a solo mission. The cable seems strong with nylon protection and the USB connector is pretty solid. There’s a controller unit that sits on the cable and it offers the basic options, so nice afterthought there. The mute feature is independent not just for the mic and sound but also for game music and sound. Lows and Highs tend to get muddled up at times but it is more because of the surround sound effects. The mic isn’t long enough and it does not reach your mouth so ambient noises are caught in all conversations. This makes it difficult with con calls, online presentations and video chats unless you are in an absolutely quiet environment. The controller unit is at an awkward point on the cable that often entangles with chair arms or slides under the seat accidentally muting the microphone or the sound. Does the Sades SA902 meet our approval? Yes absolutely. For the price, this is a must have headset. In fact, even if you have an expensive gaming headset, there really is no harm in keeping a few backups. This one does pretty well with surround sound gaming, a clear mic and attractive yet simple design. Best of all, when it eventually breaks or the cable snaps, you won’t feel bad because it only costs $20 or so to replace it. Besides, with all the color choices available, you can always get one with matching LED lights to that of your gaming rig or console.